Any master of the grill knows that proper timing is key when making a champion cheeseburger: Add the slice too early and risk melting it into a salty dairy puddle, add it too late and the cheese lacks the luxurious liquidity of a good melt. But one Minnesota burger invention avoids the topping-timing issue altogether by packing the cheese inside. 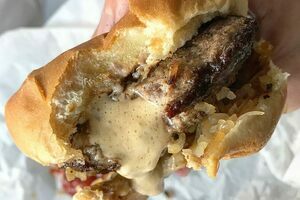 In South Minneapolis, biting into the average-looking Jucy Lucy reveals a molten cheesy core that flows from the beef like lava. It should be noted there is a heated debate over where Minneapolis's cheese-filled burger was born. Though some cite the 5-8 Club as its home, most point to Matt's Bar and Grill, a divey joint just a 12-minute drive down the street from its rival. At the very least, Matt's is indisputably the home of the misspelled creation known as the Jucy Lucy. According to the bar's website, on one night in 1954, a customer requested that his burger's cheese be sandwiched and sealed between two meat patties. It was a hit, and in all the excitement over their new burger, the bar misspelled the sign they made advertising for it. No one bothered to fix it, and to this day, Matt’s claims rights to the “Jucy” beginnings of the Lucy. Once Matt's pickle-topped patty arrives to the table, diners will be advised to resist diving in immediately, or else the molten cheesy center could burn their mouth and throat. Indeed, the Jucy Lucy is no ordinary cheeseburger; in its first 30 seconds off the grill, it's a nuclear-hot soup dumpling. Timing is everything, however. Diners should wait, but not too long (one to two minutes is recommended), as the first, early bite is best: a crumble of beef, a wad of gooey American cheese (almost nacho-like), a soft, squishy bun, sweet caramelized onions, and a salty pickle finish. While debates over the burger’s origins rage on, the essence of its magic remains uncontested: Seal two thin patties around a slice of cheese and grill until a dangerous dairy deluge is the inevitable outcome.